The Field Notes Pitch Black Memo Book comes with a black cover made from 100-lb French paper with gray type. Inside the notebook has a gray dotted grid paper that is bound with shiny black staples. 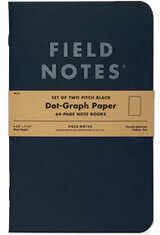 The Field Notes Pitch Black Memo Book is sold as a 3 pack in the smaller size and a 2 pack in the larger size. The Field Notes Pitch Black Memo Book is not a limited edition so it should be around for awhile! The Field Notes Pitch Black Memo & Notebooks usually ships within 1 business day unless otherwise specified. Each Field Notes Pitch Black Memo & Notebooks we sell is guaranteed to be genuine, authentic and will arrive brand new & unused! Believe it or not this is the first time that I have purchased a Field Notes notebook(s). I purchased a package of the larger size because they reminded me of notebooks that a former employer of mine used to make in house in their graphic's department and for years I always had one in my jacket pocket. Overall I think they are a great product being a bit of a cheap skate I wish they were a buck or two cheaper but people in H3|| want ice water. In short I like them because they are what they are a simple no nonsense pocket notebook made with quality fountain pen friendly paper. The 64 Dollar question is would I purchase this product again and the answer is Yes. Are pages weather resistant like write-in-rain notebooks? The Field Notes Pitch Black memo books and notebooks have standard paper, and they are not necessarily water resistant.